Manufactured with special additives to help reduce the risk of reflective cracking, PermaFix provides an immediate, permanent repair. It is easy to place in all-weather climates including cold and wet conditions, has no harmful solvents, has a long shelf life, and is more effective and longer lasting than conventional cold mix asphalt products. 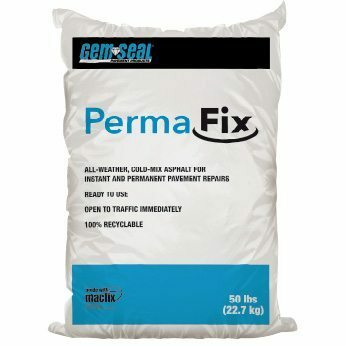 PermaFix can be used to repair potholes, utility cuts, driveways, patches, and edge breaks on roads, parking lots, and driveways. Buy Now! Pour a 2″ layer of loose PermaFix into the area to be patched. Level the loose material and then compact to a 1″ layer. Compact with a tamper or a 4 inch x 4 inch post. Place and compact additional layers until desired thickness is achieved. Properly compacted PermaFix will continue to harden over time.